In the early 1970s, racism became a subject for humor, most notably in the series All in the Family. A completely whacked take on racism is found in this AIP horror-comedy. Ray Milland stars as transplant surgeon Max Kirshner, a bigot who is suffering from terminal cancer. He also happens to be masterminding an experimental technique for transplanting heads, with a view to saving his own life. His assistant, Dr. Philip Desmond (Roger Perry), is in charge of the surgery as Dr. Kirshner lapses into a coma. Unfortunately, the only appropriate subject for the transplant operation is black death row inmate Jack Moss (ex-football star Rosey Grier). When Kirshner and Moss wake up to find they're sharing a single body, mayhem ensues. Although there are plenty of horrific overtones to the story, it's quite clearly played primarily for laughs, right from the title sequence. A roster of scientific advisors is credited, though I can't imagine what they possibly had to say about this. The comedy is dark and nasty, but actually pretty effective. Milland is suitably sour and nasty as the racist surgeon, unwilling to accept noted black surgeon Fred Williams (Don Marshall) into his clinic. Grier is lethargic and wooden, but the rest of the cast is right on the money. The special effects, predictably for an AIP cheapie, are nothing to get excited about. 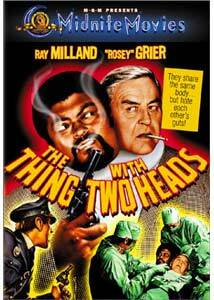 The second heads are obviously dummies most of the time, though the severed head effect for Milland during the transplant operation is quite convincing. Makeup artist Rick Baker makes an appearance as a man in a (two-headed) gorilla suit that wouldn't fool anyone. Clearly most of the budget went into an extended car chase, as fourteen police cars are demolished in pursuit of the two-headed escapee on a motocross bike. Those who appreciated this aspect of The Blues Brothers are sure to eat this picture up. Otherwise, the production values are pretty low; Kirshner's basement lab looks like, well, a basement, with a few pieces of equipment. Though not purporting to be anything great, this manages to be a funny and nasty little tale that's definitely a hoot and a holler. Image Transfer Review: The nonanamorphic picture is quite good overall. Colors are very good and the picture is detailed and clear. There are a few interior scenes with excessive grain but this may be a result of cheap film stock. Black levels are surprisingly good, with decent shadow detail. Although the appearance of the picture is dated, this is a very acceptable presentation of a 1972 film. Audio Transfer Review: The only audio track is the original English mono, presented in 2.0. There is very minor background noise and hiss, but otherwise the sound is quite good. Dialogue is always clear and easily understood. The funky score, with lots of wah-wah, comes through very nicely and adds greatly to the enjoyment of the picture. Extras Review: The sole extra is a theatrical trailer, which is in quite good condition. No English subtitles, although reportedly MGM releases later this year will begin to have them included. Chaptering is adequate. A sharply funny black comedy about racism and dreams of immortality, with a superbly cranky performance by Milland. A decent but not exceptional transfer and few extras make this at least worth a rental, though the list price is so low that purchase is not all that much more.